The SecurityGuard ULTRA cartridge provides maximum protection by trapping contaminants and particulates. SecurityGuard ULTRA cartridge is disposable and allows for quick and easy replacement. 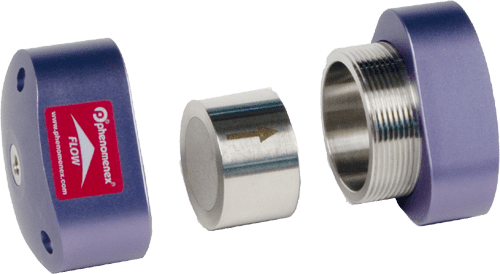 The SecurityGuard ULTRA reuseable holder has an auto adjusting tip that provides a leak-free connection to virtually any UHPLC column. Watch how easy it is to install SecurityGuard ULTRA and replace SecurityGuard ULTRA cartridges. Universal Holder Fits 2.0 mm, 3.0 mm, 3.2 mm, 4.6 mm, and 7.8mm ID columns Disposable guard cartridge effectively traps contaminants without interfering with your chromatography Universal Fingertight connection to HPLC columns- no wrench required. Introduce your HPLC Column to SecurityGuard Catridge System. SecurityGuard Semi-Prep and Preparative is designed to protect any Semi-preparative HPLC column (9 to 16 mm IDs) and preparative HPLC columns (18 to 49 mm IDs). The SecurityGuard semi-prep and preparative cartridge systems are easy to use and compatible with a wide range of semi-preparative and preparative columns (standard preparative columns and axial compression). The versatility of the SecurtiyGuard Semi-preparative and Preparative guard system make this the desired choice over standard HPLC guard columns. This technical note explores how SecurityGuard PREP can improve column lifetime and productivity.